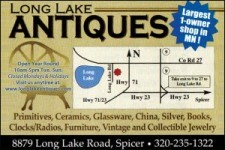 Long Lake Antiques is an antique store like no other in Central Minnesota. We are located in Willmar, Minnesota and are proud to have an inventory of over 10,000 items. With items coming and going all the time be sure and check with us often. Better yet come and visit. You’ll find art, books, metal, clothing, ceramics, glassware, jewelry, lamps, toys and much more. We’re near beautiful Long Lake just north of Willmar in the heart of Minnesota. If you can’t come here then check out our online store. We are closed on Monday’s and National Holidays.